Indeed, there are solutions to every problem in life except HIV/AIDS. LOL! Even the HIV/AIDS can still be managed although it is incurable. The disturbance one gets from U-report's text messages is worse than some problems in life. As a matter of fact, some persons prefer having headache to receiving U-report's numerous text messages. Are you wondering what U-report is? Well, National Youth Service Corps (NYSC) members (like me) who served in the Northern part of Nigeria in 2014 and 2015 need no explanation since they already know what I am talking about. However, for the benefit of all, U-report is a free SMS social monitoring tool for community participation, designed to address issues that the populace care about. 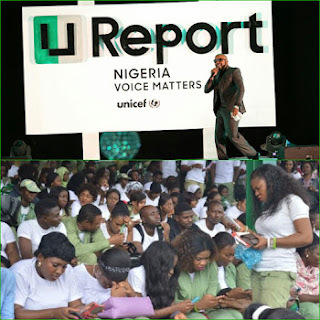 In 2014, U-report visited Nigeria, but instead of leaving like every other visitor, it became an autocratic/dictatorial landlord, making corps members its first victims. On a mandatory order by the Federal Government of Nigeria, corps members (as we were being told), under the strict supervision of NYSC officials, were not only forced to join this platform but were also commanded to invite their friends, enemies, well wishers and relatives to join the platform. It even got to a point where corps members were required to submit the names, phone numbers and addresses of people they've registered on U-report before they could do their monthly clearance. SMH! The exercise was really annoying, but as Nigerians, we playfully got over it. We never knew "it is not over until it is over". 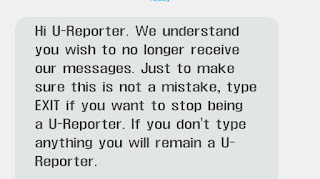 U-report had since become a thorn in our flesh through the incessant text messages it sends to us (its subscribers). Consequently, most of my friends had to do away with their affected SIM cards, but I could not because I used my primary SIM cards, neither could I opt out even when I wanted to. This is the most annoying part of it all --- we were only taught how to opt in. This is really tricky and crafty! But the good news is that I am no longer a U-reporter, and you too can stop being one if you want. Important notice: If you've never served but keep receiving text messages from U-report Nigeria, with the number 24453, do know that your number(s) was/were registered on U-reporter's platform by your friend, enemy, sibling or relative who had served. Please, don't blame them for their actions. You would do same if you were in similar situation. Kindly follow the steps below to opt out. 2. After a minute, you will receive a text message like the one below. 3. Reply with or type EXIT, then hit the "send" button if you really want to opt out. 4. You will receive another message shortly just like the one below. 5. Once you receive the second message, you are good to go! 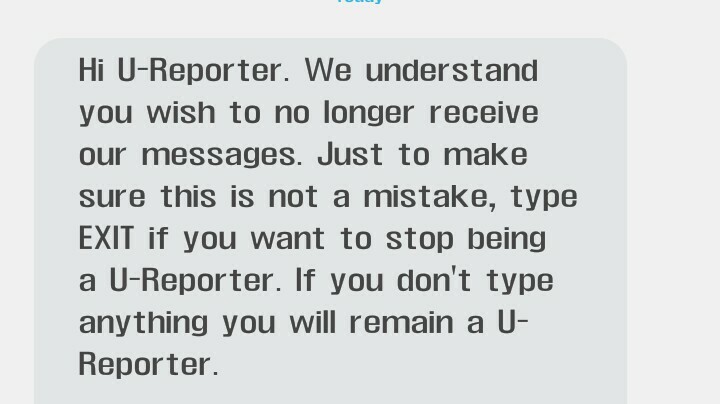 No more spam messages from U-report. However, you can always join the platform by sending the word JOIN to 24453. Please, kindly use the comment box to give us feedback.